Bill Anton is an "artist's artist". His bold brushwork and sophisticated use of light have brought his work to the forefront of Western art. "Warming Up" is a dramatic and beautiful painting that made it's mark at auction in early 2008. 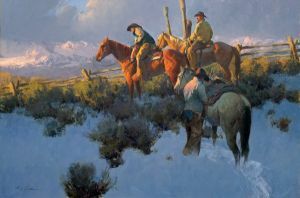 The cool colors in the foreground contrast with the warm colors throughout the upper half of the painting giving the viewer the exact feeling of the riders as the sun rises warming up the snowy landscape.